I just heard from the folks at TKGA and there is still room available at the Grand Retreat if you are interested. Click here for information about the retreat. It should be a fun event. The homework for my course is available and a diligent student has already found a mistake. For the ribbing swatch, disregard Row 2. If you don't, you will wind up with seed stitch! No matter how many times I proofread something, mistakes seem to get through. If you are signed up for the class and you have ANY questions, please contact me. There has been a steady stream of new students. Most who sign up for the course do so as a preliminary step before beginning the Masters Program. It does let them know what to expect. It is scary to turn your work over for evaluation but you can't improve if you don't know what needs improvement. Keep the lessons coming my way! I hope you are finding the tips helpful. 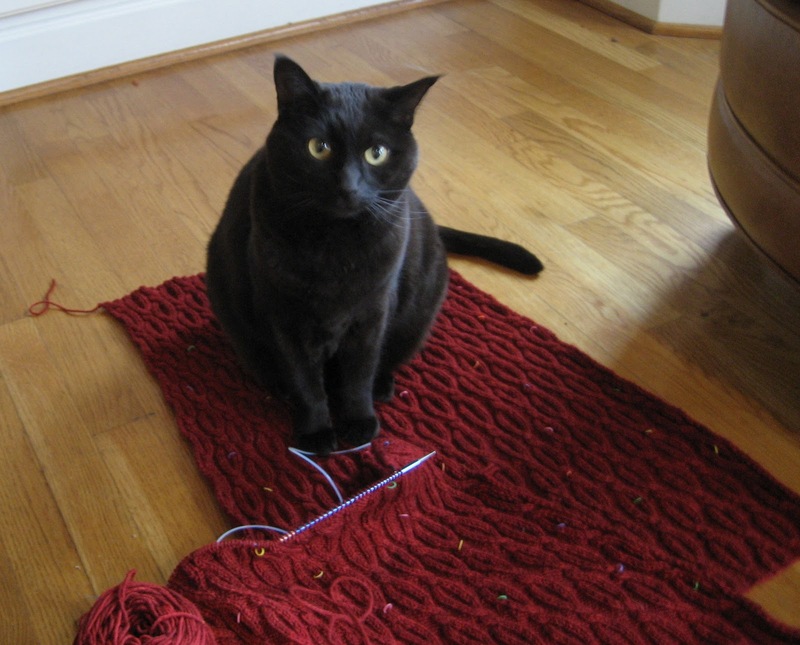 Many knitters have problems with the standard bind off. The photo below addresses two problems. 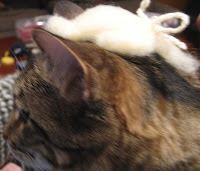 If the bind off is too tight, it pulls in the top (as you can see in the photo). For a project that isn't seamed like a scarf, this is just plain unattractive. If the bind off edge is to be seamed or if it is to be used for a band, the edge will be very inelastic. This can make the garment difficult to put on or uncomfortable. 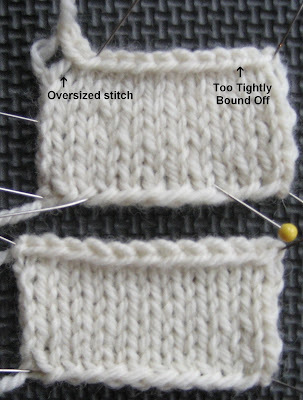 The elasticity of a bind off edge and the cast off edge should be similar. When you bind off, don't cut the yarn until you have stretched the bind off edge! You can always undo it and try again. How do you fix this? As you bind off don't pull the working yarn too tight. Check each stitch after you bind it off to make sure it isn't too tight. If this isn't enough, use a larger size needle to bind off. I noticed on the TKGA forum on Ravelry that Always Rosie mentioned the first stitch of the bind off as a problematic area. 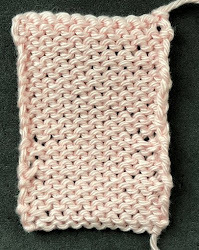 This stitch shouldn't be a problem if you bind it off loosely. If you don't, it distorts the right selvedge. The other issue is the over sized and ugly last bind off stitch. 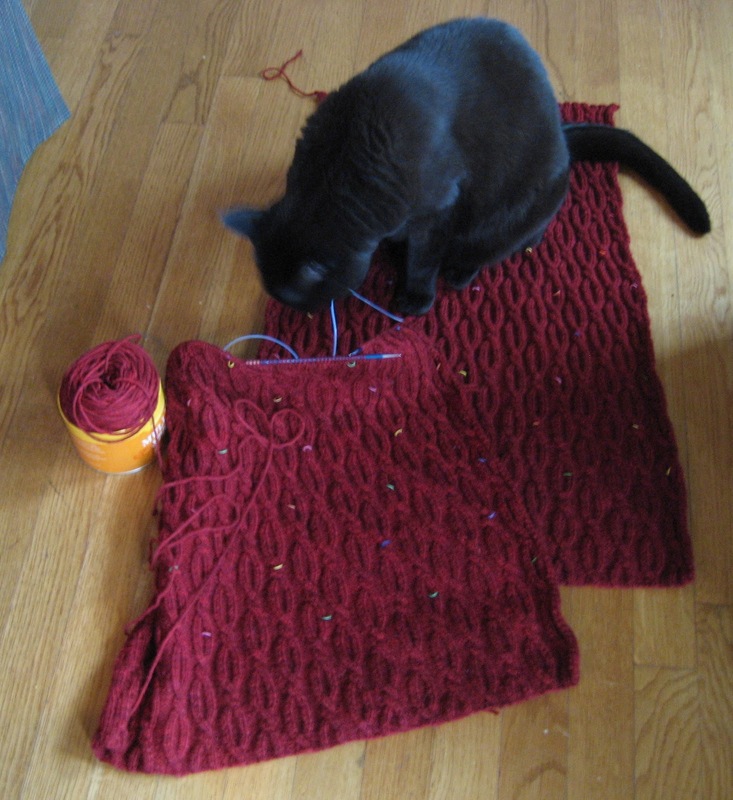 My approach to knitting is to figure why something happens so you can prevent it rather than have to fix it later. How does the final stitch get so stretched out? When it is the only stitch on the needle, it can stretch and elongate if it has to bear the entire weight of the fabric. Once a stitch is stretched out, it is hard to "unstretch" it. When I am binding off and I am close to the end, I make sure to hold the fabric so that it doesn't hang from the stitches on the needle. When I bind off that last stitch, I make sure just to use the tips of my needles, I also try to manipulate the stitches as little as possible. The further you insert the needle, the larger the stitch becomes. There are several other things you can try which I demonstrate in this week's video. Another thing you can try requires some pre-planning. On the row BEFORE the bind off, wrap the first stitch (this will be the last stitch on the next row) the opposite way (under the needle for purl stitches and over the needle for knit stitches). This "twists" the resulting stitch and also makes it tighter and smaller. Work the rest of the row in the pattern as established. When you bind off the last stitch, you should work it through the back (while supporting the fabric and using just the needle tips). This should eliminate the over sized stitch. There is a UK basketball game Saturday at 4pm so the Salon will be on Sunday from 2-5pm. By the way, the opera, The Enchanted Island, was wonderful...comic and heart-breakingly beautiful at the same time. Jan joined me but I doubt I'll get any takers for the next one on February 11th, Gotterdammerung. The running time is 6 hours. 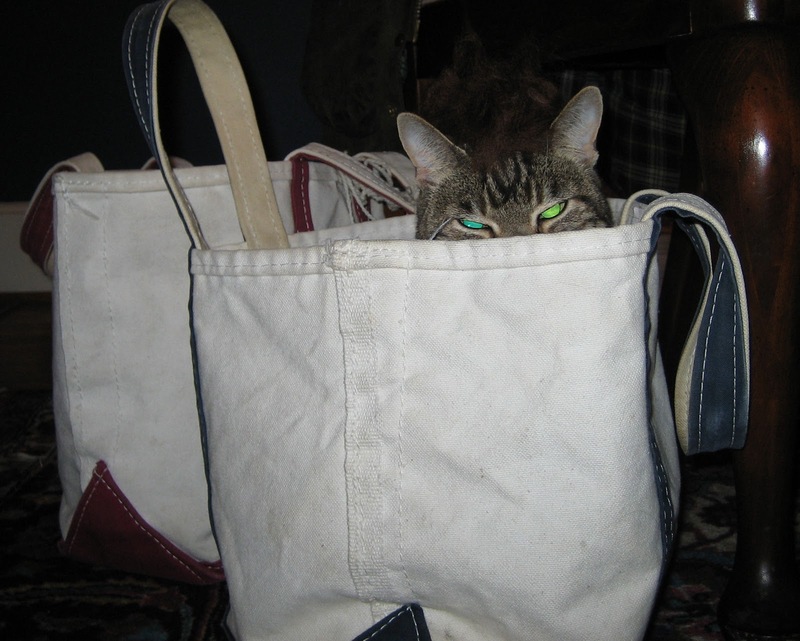 I noticed I have not put in any of the obligatory cat photos which I will remedy now. These are from a Salon before Christmas. 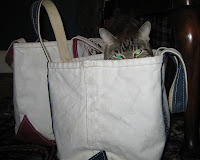 Jan was doing some needle felting and Petipa could not resist the roving in Jan's bag. Jan quickly worked up a Mozart wig which Petipa actually tolerated. The cabled tunic is coming along fine. The back is finished and I am almost done with the front. I have to seriously think about the neckline shaping. I want a ribbed, funnel-style neckline with bateau shaping. I should have it finished up by Sunday if all goes well. Sleeves are next. Anytime I lay out any knitting, George feels it is his duty to make sure it stays put. In the second photo he is inspecting the cord on a Signature needle. By the way, the cord on my shorter Signature needle broke at the join while working on this project. I have had the needle for at least a year but Signature replaced the needles at no cost to me (not even for shipping) within a week's time. I am very impressed. I like the stiletto tips for cables. In the tip last week about cables I mentioned you distort the cables less if you use just your needle tips when making the cables. The stilettos make it much easier. By the way, these photos show the true color of Vlad. It is a beautiful deep red. - Trong trí nhớ của Sơn Tinh kia, Tôn Vân và sư tôn đã từng đại chiến, nhưng cuối cùng bị sư tôn thi triển thần thông nuốt lấy toàn bộ thân thể, rồi sau đó rời khỏi. dịch vụ thành lập doanh nghiệpn dâng lên. Thế nên cho tới bây giờ, đối với Thiên Vận Tử hắn vừa kính lại vừa sợ. Bí mật này ngay lập tức bị hắn chôn thật sâu trong đáy lòng, lúc này là lần đầu tiên hắn kể ra với người khác. - Vẻ mặt sư tôn lúc ấy như thế nào ? - Việc này … giống như là có chút tiếc nuối, có lẽ là tiếc nuối. - Tuy nhiên, trong ký ức của Sơn Tinh, sư tôn có chút kỳ quái, ta chưa bao giờ nhìn thấy sư tôn mặc áo xám!